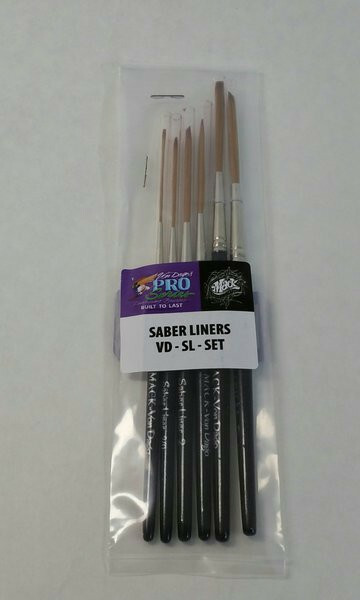 Produktinformationen "MACK-DAGO Saber Liner 6 Brush SET"
From pulling long out lines on hand painted letters & numbers, to performing a smooth scripted name, these new specially designed brushes can handle whatever skill level you have." • Including some light ‘n tight “pinstripe designs” for those that can stripe. • Designed for the master professional, yet extremely beginner user friendly! • Made with a specially imported **soft** synthetic hair that’s the thing to real hair as I’ve ever seen!! Weiterführende Links zu "MACK-DAGO Saber Liner 6 Brush SET"
Kundenbewertungen für "MACK-DAGO Saber Liner 6 Brush SET"